Josie Byrne's life is spiraling out of control. Her parents are divorcing, her boyfriend, Nick, has grown distant, and her physics teacher has it in for her. When she's betrayed by the two people she trusts most, Josie thinks things can't get worse. Until she starts having dreams about a girl named Jo. Every night at the same time—3:59 a.m.
Jo's life is everything Josie wants: she's popular, her parents are happily married, and Nick adores her. It all seems real, but they're just dreams, right? Josie thinks so, until she wakes one night to a shadowy image of herself in the bedroom mirror—Jo. Josie and Jo are doppelgängers living in parallel universes that briefly overlap every twelve hours at exactly 3:59. Fascinated by Jo's fabulous life, Josie jumps at the chance to cross through the portal and switch places for a day. But Jo's world is far from perfect. Not only is Nick not Jo's boyfriend, he hates her. Jo's mom is missing, possibly insane. And at night, shadowy creatures feed on human flesh. Josie is desperate to return to her own life. But there's a problem: Jo has sealed the portal, trapping Josie in this dangerous world. Can she figure out a way home before it's too late? From master of suspense Gretchen McNeil comes a riveting and deliciously eerie story about the lives we wish we had—and how they just might kill you. Gretchen McNeil knows how to write about the things we fear, even the things we don't yet *know* we fear. 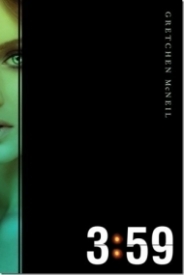 In 3:59, she delivers another fast-paced page-turner that showcases her best writing to date. A gripping mystery, some interesting science, and a fun premise kept this reader saying "just one more chapter" long into the night. The strength of this story is the fast-paced mystery. Even though I was able to figure out several things before the main character did, the story moved so quickly, I didn't mind. I just enjoyed the ride. There are twists and turns and plenty of suspense. Readers who love a mystery with a dash of science and some heart-pounding thrills are going to eat this up. The premise is highly entertaining. Time travel can be tricky, but Ms. McNeil handles it well. Difficult concepts in physics are distilled down enough to be accessible without feeling like the author is giving her readers a Psychics for Dummies crash course. The addition of mysterious (and murderous) creatures in the alternate universe added more entertainment and suspense. Finally, I enjoyed the heroine, even when I didn't totally connect with all of her actions. She's book smart but often naive in her relationships, and she grows quite a bit throughout the book. The romance was interesting without taking away from the time travel/alternate universe mystery in the story, so readers who want a dash of swoon with their sci fi will be pleased. There were a few moments when I didn't feel fully convinced that the characters' actions were plausible (like when two teenagers manage to break into a high security facility using flirtation and obvious subterfuge), but I don't think those moments detract from the overall thrill ride that is this book. They certainly didn't keep me from turning the pages. 3:59 is a fast-paced thriller with plenty of twists and turns. Be prepared to stay up way past your bedtime because you won't want to stop reading once you start!